William J. Shkurti, an adjunct professor of public policy at the John Glenn Institute of Public Affairs at Ohio State University, served a 1970-71 tour of duty as an artillery officer in Vietnam with B Battery, 2/35th Artillery, at Fire Support Base Lanyard near the Cambodian border. Shkurti had graduated from Ohio State in 1968 and then enlisted in the Army. He served in Vietnam at a time when morale was plummeting. That experience—specifically, trying “to find some meaning in the sacrifices of all the soldiers who fought and died in the those last stages of America’s withdrawal from Vietnam”—is what is behind Skhurti’s first book, Soldiering On in A Dying War: The True Story of the Firebase Pace Incidents and the Vietnam Drawdown (University Press of Kansas, 356 pp., $34.95). What happened at Fire Support Base Pace (which was known as Lanyard when Shkurti served there) was that two groups of American troops refused an order to go out on a night ambush in the fall of 1971. That action made the news and caused a small sensation back home. Many saw it as emblematic of the crumbling morale and discipline of the about-to-withdraw American Army in Vietnam. 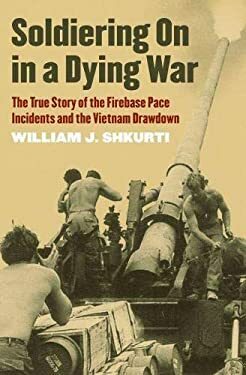 Shkurti looks deeply into that incident (which took place after he had returned home), other “combat refusals, ” and other kinds of unsavory incidents (including My Lai), and concedes that the Army in Vietnam was dealing with “sagging morale, fickle allies, and a determined enemy” in the war’s late stages. He says that “discipline problems, fragging, racial tension, and drug abuse” took place, but mainly happened “back in the rear.” And he concludes that combat refusals in general were blown out of proportion and did not represent a wider pattern of crumbling discipline.